Being assertive is defined as the ability to stand up for your own rights in a calm and positive way without being aggressive or submissive, accepting the wrong. There are many situations in our life that will want us to stand up for ourselves. Our duty to self should never be compromised for the happiness and satisfaction of others. We have to ensure that there arises no situation where we concede to others and later regret for our act. In today’s time , we would be crushed upon if we don’t stand up for ourselves. Saying ‘No’ to someone is always considered to be rude behavior especially in our country. We feel that it is our duty to fulfill the requirements of our friends, relatives and any other acquaintances even if we have to forgo our comfort or routine. But this so called generosity and humility is laughed upon nowadays. It is high time we change our perception of helping others before helping ourselves. When you take more care of others than yourself, you should not be called generous but foolish. Indian culture and tradition were formed centuries ago when everyone was soft and straight minded. More than anything else, there was a sense of truth and virtue in their behavior. But, today the scenario has changed and people have no more time to ponder about the generosity and kindness we possess. All they care about is to get their work done as quickly and as easily possible. People have no time to appreciate our generosity but they all are ready to step on us and get their things done effortlessly. . So the most intelligent thing to do to survive in today’s world is to step out of the so called good shoes and take care of ourselves before we get into helping others. Love yourself and respect yourself is something that everyone keeps insisting on, but we should realize that it is one of our primary duty to take good care of ourselves. Nothing wrong should happen to us. We should always stand by our necessities and requirements before heading off to favour the people around us. It is not a justifiable act to put others needs before ours and in turn suffer because of it. This is not an act of selfishness but of good sense. We are not denying helping anyone in spite of being able to in a comfortable way but we just place our comfort and happiness first. Assertiveness trains you how to say “No” diplomatically, without offending anyone. 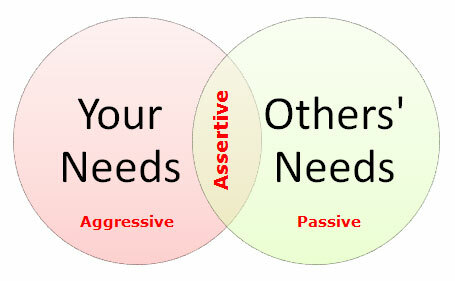 The core idea of assertiveness is to say no to things you don’t support in a firm yet polite manner. Saying ‘No’ becomes a very tough thing only because it usually comes across as harsh and sharp. We have to learn the art of saying ‘No’ to things diplomatically and in such a manner that the other person feels that you are genuine in saying no. The entire process of opposing other’s views become simple. We should always remember to maintain a calm yet firm tone when we say ‘No’ to others. Thus, they don’t feel offended by it. But they should know that they cannot negotiate further on that issue. Similarly we should openly express the reasons behind our difficulties in helping them out as there is a high possibility that they would understand and the entire process becomes smooth. We offend a person only when we say things bluntly and on a sharp note. If we could just put the same thing in a diplomatic, polite manner and with a friendly touch then things will fall in place automatically. There is only a thin line drawn between favoring someone and being fooled by them. We should make sure that we are generous enough for people to be happy about and not go around laughing at us. This is the reason we should always priorities ourselves first and then help others. If we go on helping others without caring about our wellbeing, then we will always be ladder on which others climb on to become successful. We should be in a situation where, we have nothing to lose if we help others and this will lead us to be intelligently generous. It is essential for us to remember that overloaded generosity may add up in our book of good deeds but it certainly is not the formula for success in today’s highly competitive world. This entry was posted in Personality development and tagged aggressive, Assertiveness trains you how to say “No” diplomatically, generosity, happiness, intelligently generous, Our primary duty, satisfaction of others, submissive, today’s highly competitive world, truth and virtue in their behavior. Bookmark the permalink.